I really like the beveling between the slats, nice touch! The feet are really a requirement in my mind. Getting things perfectly flat is tough, then you are assuming that the place it will sit is also flat 8^). The corners are the perfect locations. Thanks. I do the bevels so the “spaces” for wood movement look more finished. 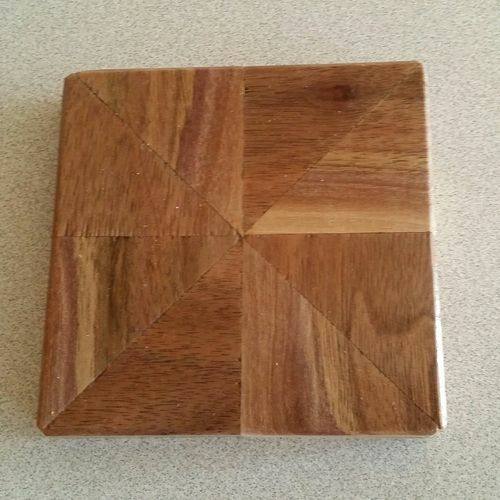 The “feet” were cut-offs from some mitered corners (making a number of frames) and were a nice fit for the corners. Proof that my savings even little pieces is the right thing to do!! 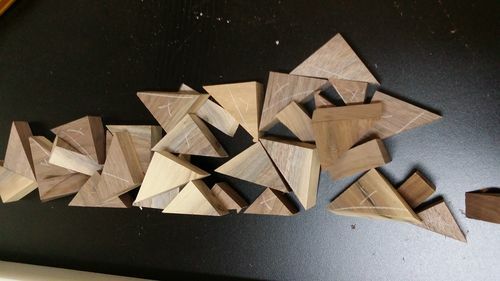 Decided to see if I could glue up a bunch of the mitered corner cutoffs…worked ok…hard to go wrong with walnut! The feet are an artistic feature; that it happens to solve a problem at the same time is merely a BONUS! “Craftmanship”...code for “oops – let me fix a mistake while making it look planned from the beginning” I do a lot of that!! “Did you build it like that”....it depends, do you like it. Never a mistake. The recipient seemed to like it very much…so calling it a win! Nice design, I like it, and congrats on your DT3. I feel like almost everything I build has a moment or two of “Oops, how do I fix that?” I also save little pieces like you, and most of the time I can find a place to use them on one of my projects.